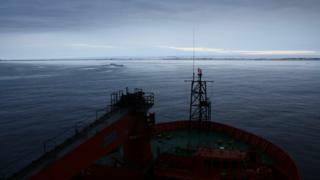 The rescued Australasian Antarctic Expedition (AAE) has arrived at Casey base on the coast of East Antarctica. As its ship, the Aurora Australis, put down anchor, news came through that the vessels it left stuck in ice three days ago had finally broken free. Both the AAE's original carrier, the Russian Akademik Shokalskiy, and a Chinese ice-breaker, Xue Long, are now moving towards clearer waters. The AAE is only making a short stop at Casey before heading for Hobart. In other words, the Aurora crew will be resuming the work they had to drop when they were called by the Australian maritime authorities to assist in the rescue of the Academik Shokalskiy and the AEE in Cumberland Bay, about three days' voyage away. The captain of the Russian ship sent out a distress signal on Christmas Eve because it had become beset by thick ice, and because large icebergs were moving close by. The rescued AAE leadership, together with weather and ice specialists, continue to analyse the data to try to explain exactly what led to the Russian ship's entrapment. One of the AAE's co-leaders, Greg Mortimer, told the BBC World Service's Discovery programme what he suspects happened. "[We had] an enormous area of very old ice (frozen sea ice of 10-15 years of age), which was to the east of where we were, and to the east of the famous Mertz Glacier. "All of a sudden, the mass of ice was just spat out to the west, like a cough-ball if you like. "It was a massive area of ice hundreds of square kilometres in size, and we just happened to be there at the time." The senior AAE team will refine their theories as to what kind of natural phenomenon might trigger the catastrophic release and movement of so much thick ice. Marine biologists on board the Shokalskiy attempted to drill though it and failed at 3.5m. Several scientists on the expedition with considerable Antarctic experience said they had never seen pack ice like it. The expedition leader, Prof Chris Turney, said that the most likely source of this thick old ice was so-called fast ice. This is the flat sheet of ice that stretches between the continent's edge and the seawater edge. Several hours before the Shokalskiy began to become surrounded by ice floes on 23 December, the captain had taken the ship into an ice-free area of clear water, known as a polynya. Prof Turney speculates that the rafts and chunks of ice that later amassed around the Russian ship originated from the ice on east side of the open water. "For whatever reason, it was broken up and with the strong southeasterly winds, the ice was driven across into our path. And then over the next 48 hours or so (with the persistent southeasterly winds), we went from 2 to 4 nautical miles from the sea edge to 20 nautical miles. It was a remarkably large breakout of ice. It's one of these events that happens occasionally. We were in the wrong place at the wrong time." In the days following the Russian ship's entrapment, a much larger Chinese ice-breaking vessel pushed its way into the new monster pack. Like the Australian Aurora Australis vessel, the Chinese Xue Long had been summoned to assist. But after several days of valiant struggle, the Chinese ship conceded that it was stuck, too. Although the Xue Long and the Shokalskiy are now reported to be free of the thickest ice, normal shipping activities have been severely disrupted because of the rescue. There will inevitably be questions now from institutions and insurance companies about matters that go beyond the weather conditions and ice radar maps; whether human error or misjudgement contributed to the Shokalskiy being in the wrong place at the wrong time. Greg Mortimer is one of Australia's most renowned mountaineers and an expedition leader who has visited Antarctica every year for more than two decades. When going south, he says, one needs to expect the unexpected: "Every time, I've been there, I don't know what to expect of Antarctica. It doesn't treat fools kindly. Whether or not we go into the basket of fools, history will tell. But [Antarctica] tends to jump on the back of your neck if you make a mistake."